Jack Claeys tags a Michigan runner out at the plate. The sophomore catcher scored 2 of Northwestern’s 9 runs in Sunday’s loss. 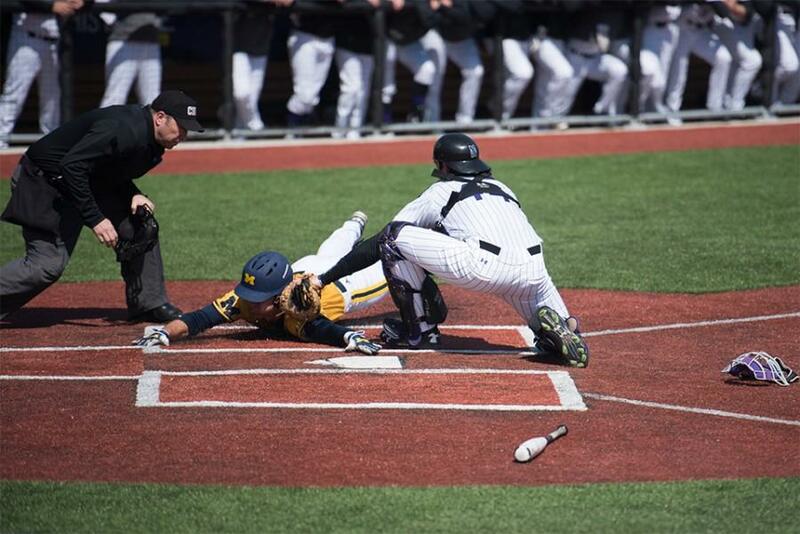 Like the rest of Northwestern on Sunday, shortstop Jack Dunn was oh-so close. In three at-bats through the first five innings, the freshman was a triple shy of the cycle after a double, home run and single. But after providing much of the Wildcats’ early offense, Dunn failed to complete the cycle and, much like NU (7-21, 1-5 Big Ten), could not quite finish the job as Michigan (20-5, 3-0) completed a weekend sweep of the Cats after taking two games Friday. As NU dropped its fifth straight conference game, Dunn was one of the few bright spots against the Wolverines in the series. He broke up Brett Adcock’s no-hitter in the second game of Friday’s doubleheader and went 3-for-5 with 5 RBIs, including an RBI hit-by-pitch. On Sunday, Dunn’s offensive outburst helped NU stay competitive in a wild, back-and-forth game, especially in the first four innings. After the Cats loaded the bases in the bottom of the third trailing 6-4, Dunn launched his first collegiate home run over the left field fence for a grand slam. The lead had already changed hands four times before the shortstop’s bases-clearing knock, but the 8-6 lead would be the last NU held all day. Despite NU’s frequent comebacks early in the game, the Cats couldn’t pull through when they needed to most. In the bottom of the eighth, NU had the bases loaded and none out but only scored one run in the inning. Junior Matt Hopfner led off that inning with a double, and after Michigan reliever Carmen Benedetti walked the next two batters, sophomore Bryan Pall came in and struck out three of the next four batters to end the threat. Hopfner also started Sunday’s game on the mound after performing well in both games Friday offensively. His outing didn’t quite go as planned though as he gave up 6 earned runs in 2 innings of work. Even though Hopfner struggled Sunday, he still took away some positives from his start. And with only one day off before the Cats’ next game Tuesday against Illinois-Chicago, he said the positives are important to capitalize on.